Labor Day is over and for anyone who works in education, is going to school, or has school age children it is back to school time. I started back 3 weeks ago, and I’m definitely ready for the “routine” to kick in. I still feel like I’m on summer time. Well to celebrate “back to school” and maybe get a few of us motivated I was contacted by Wise Décor and given the opportunity to host a giveaway. They have a HUGE selection of wall words and designs to choose from. Their website is arranged such that you can search by room, theme, style and much more. They also have color and font options to personalize your order and many example photos. For all you teachers out there check out the Classroom Wall Decals. 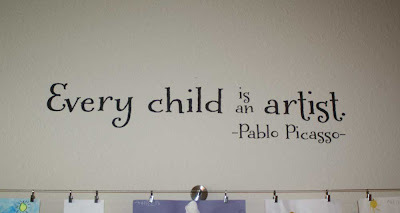 They have a ton of humorous and inspiration quotes and decor for the classroom. There are lots of examples of fun quotes that will jazz up any area of the school. Another great thing about wall words is they are removable if you move classrooms or switch subjects. No worries about having to repaint or repair holes in the wall. 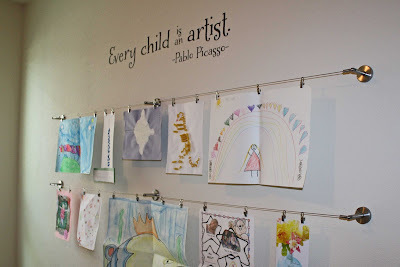 As I was browsing this school section I found the perfect wall words to finish a project a year in the making. We have wanted to set up an art board for each of our girl’s art work. They are always drawing and crafting and have wanted to display their work in their room. 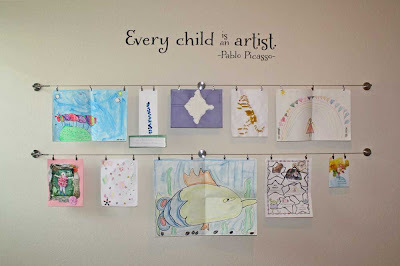 About a year ago I “pinned” a clothesline style art display that I thought was cute. Just this summer we finally got around to getting it set up, but it was missing something. I didn’t want to paint on the walls or make more holes for another frame, so a wall decal did the trick! 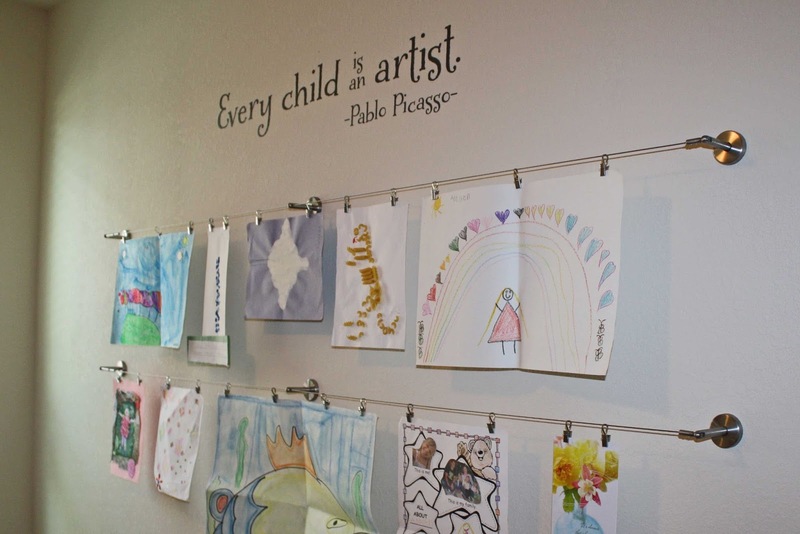 Check out Addy’s art display with the Picasso quote wall word received from Wise Décor. When the package arrived the wording was securely wrapped and included thorough directions on how to apply the wording. They also included a sample word to practice with before we applied the real thing. We followed the directions step by step. It was easy and turned out perfect!! It looks like I painted the wording directly on the wall. Addy really enjoys swapping and arranging her art work. I know as this school year goes on she will bring home plenty of creations to hang on her wall. No bulletin board or pin holes needed. Do you want to try out some wall words for home or for your classroom? Well now is your chance. Follow the links below you will be entered in the drawing to win a $75.00 gift certificate from Wise Décor! That’s $75.00 to choose whatever wall words you would like. Entries start Saturday, September 7th and run through Saturday, September 14th at 12:00 a.m. A random winner will be chosen and announced on Sunday, September 15th. Good luck! !